OK, this one is easier. Too easy. Can't really think of a prize that won't give it away, so how about a jar of vegemite. Yumm! Contest rules below. One of my dinner companions asked me what I thought about one of the world-famous local beaches, and I made the mistake of speaking the truth ... "It's much smaller than I thought it would be." That led to an earful of how ratty my friend found certain US beaches, including one I used to live on in Florida that is at least 20KM long and has far whiter and cleaner sand, better waves, less risk of great white sharks, and a not quite as ratty town behind it. Ah, the stuff from which legends are made. Then, switching gears back into a friendly mode, came the next question ... "What did you think of the bridge?" "Wonderful! Very nicely lit. 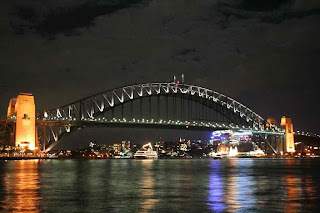 I'm thinking about taking the bridge climb tour this week so I can take in the whole harbour." Well chosen words indeed ... I got to eat my steak in peace as the locals basked in the glow of such praise. Don't get me wrong, I like it here ... it's like California without the drive-by's. Can you be more specific ;~) ... never mind, close enough. Next time you are in Germany, you get the jar of vegemite. Sydney! But Maribeth still gets the Vegemite. Bleh. Where in the World is Mikey This Week?